The HELCOM Data and Map service is a Baltic Sea oriented online mapping tool combining spatial data from different HELCOM thematic map portals. 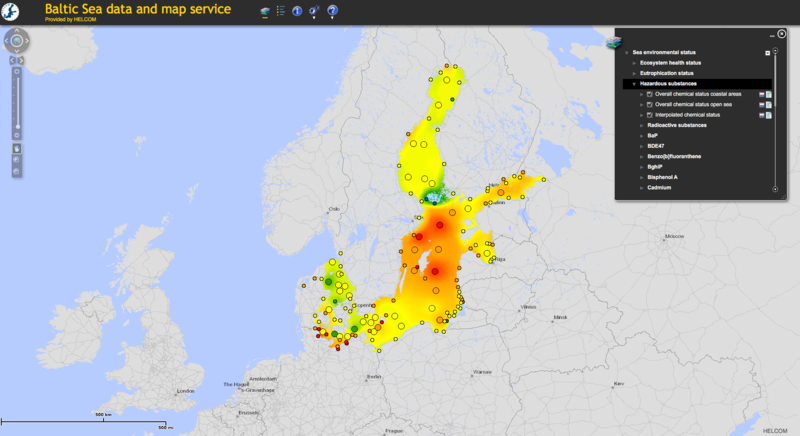 Where can I find spatial data on the Baltic sea relevant for MSP? What is the current status of different environmental aspects in the Baltic Sea? How can one develop a tool which includes spatial data on maritime issues? According to the HELCOM data and information strategy, all HELCOM monitoring data should be openly accessible online. The map service contains also datasets from sources other than HELCOM. All available map data is accessible from all thematic map services for overlaying purposes. Each dataset is accompanied by a metadata file which describes the dataset. Presenting data and information in suitable ways for indicator reports as well as thematic and holistic assessments to support policy formulation and decision-making. The interactive map provides a large variety of layers with spatial data. Biodiversity: Biodiversity related datasets such as species distribution and protected areas. This practice is highly transferable and can be applied for in other regions to share spatial data on a sea basin level.